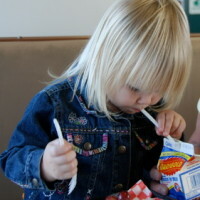 Home » Nutrition » Best Weight » Should My Child Go On A Diet? Kids are rarely prescribed a diet, unless their weight puts them at a critical or immediate health risk. Changing the types of foods that the child eats and adjusting the portions are better steps to preventing or treating overweight. These approaches work best for growing children, emotionally and physically. Encourage your child to eat a healthy breakfast, to eat regular meals, and to engage in exercise most days of the week. Some research shows that, especially for teens, dieting can be counterproductive and can increase the risk of eating disorders and weight fluctuations. Help your child feel good about him/herself, no matter his/her shape or size, and model good health behaviors. Focus on choosing healthier foods, increasing fruits and vegetables, whole grains, beans, and lean proteins. Encourage more exercise by getting your child involved in sports, cycling (with a helmet and no head phones), dancing, playing outside, or any other activity he/she enjoys. Get moving as a family by taking family walks, playing tag, creating your own games, or hiking together. Be prepared to make several suggestions for food choices and exercises – kids can be reluctant to change at first. Do your best to stay positive and remember that change can happen, but it progresses in small steps. « Eggplant –Can It Be A Kid’s Veggie Choice? Comment on Should My Child Go On A Diet? Good points, Melissa. And one of the most important things that parents can do is “walk the walk” – that is, serve as role models. That doesn’t mean you have to be “thin.” It means that if you want your kids to eat healthfully and to be physically active, they need to see you trying to do the same. I heard this from parents of teens who lost weight and kept it off. Some kids may even want to exercise or prepare healthy foods right long with you. And always give kids choices so they feel “ownership” in what they do. Great article and so important. I personally feel children shouldn’t even hear the word “diet” as it sets them up for a lifetime of issues around food. Your tips really solve any issues kids may have with weight issues. Great article Melissa! I’ll be adding a couple of these points to my presentations for parents of school-aged children. I also agree with both comments made! I couldn’t agree more. Great points by all and it is very interesting how the term “diet” has gradually become a reflection of weight reduction efforts vs. a term reflecting the types of food or beverages a person consumes. I rarely use the word “diet” when talking to kids, teens and families. I try to always say – tell me about the foods you like to eat or your favorite beverages.